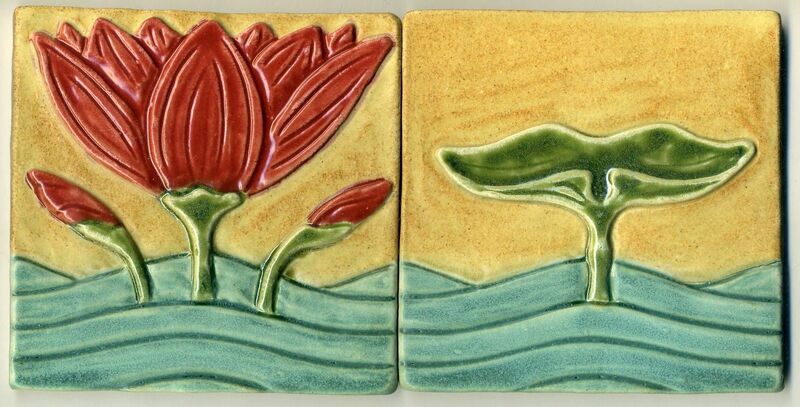 This tile set consists of two water lily tiles and four lily pad tiles (six tiles in total). 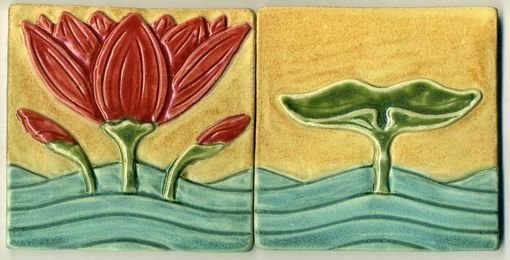 Each tile measures approximately 5" to 5 1/4" square and is made of durable stoneware ceramic. The set is designed to be installed as a backsplash behind a sink or in a shower, near a tub, or other water feature. The tiles could even be placed out doors as a decorative garden feature. These tiles are resistant to extremes of heat and cold, freezing and thawing. They are impervious to moisture. Dimensions: Each tile: approx. 5" to 5 1/4" square. Total overall dimensions: 5 1/4" high by approx. 31 1/2" with grout lines.